I see something like that and wish that I could get at the story behind it. Sure you can get his stats in a couple of places. And here is a clip from this year’s Montgomery Biscuits media guide. Hall has exceeded expectations since being picked up by the Rays during the 2007 season, and an unexpected quick climb through the minors should run through AAA in 2011 with the chance for a quick start in Montgom- ery... 2010: Went 6-9 with a 3.52 en route to Southern League Mid-Season All-Star honors... Set a new Biscuits record with 35 consecutive scoreless in- nings, snapping Brian Baker’s 2009 mark of 30 with a scoreless first on 6/12... Gave up 1 HR over his first 49 innings, but 10 HR from June-on... Struggled in the 3rd (5.40 ERA, 5 HR) and 5th (7.40, 3 HR) 2009: ERA dropped back below 4 as he spent whole campaign with High-A Charlotte... Led the Florida State League in wins... Strikeout numbers climbed, walk totals remained the same... Was splendid in 3 daytime starts, going 2-0 with a 1.13 ERA... Had his best start of the season in his last start of the season, allowing just one run on two hits while striking out 8 and walking none before being pulled with two outs in the ninth. 2008: Spent whole season in Columbus... Enjoyed a 10-3 record despite the highest ERA of his young career. 2007: Experienced his greatest success in his rookie season, going 5-1 with a 1.55 ERA as a starter between Princeton and Columbus striking out 63 and walking just 15 in 13 starts that covered 75.1 innings. Jeremy came to the Bulls from the Biscuits when Dirk Hayhurst went on the DL. He made his first appearance on April 28th. He did not do very well over the next five appearances and seventeen innings. He was moved to the Hudson Valley roster a few days ago. Now I’m guessing that he’s going home. Good luck, young man. All the best. If Rick Stroud of the St. Petersburg Times has got it right, Alex Cobb has been scratched from today's game in Toledo. He's reportedly on his way to St. Pete for a Tuesday start against the Rangers. The plan, I think, was for Edgar Gonzalez to start the first game today and Cobb to start the second. Guess we'll have to wait and see. In the near term, I'm guessing Jeremy Hall, who was transferred to Hudson Valley on paper, may be back. But the Rays are gonna have to put someone on DL/option to Durham (Gomes?) to make room for Cobb. Reason enough to try to catch the opening comments tonight. UPDATE: As I write (5:45) the Bulls are in Toledo watching the rain come down. At best they might get in one game tonight. In the meantime, I guessed wrong regarding who might be starting in place of Alex Cobb. I'd forgotten about new guy Jay Buente, who has a lot of AAA starting pitcher experience. If they were to play a second game, Solondz is reporting that Buente would start. Does not look good, at the moment, for even one game, much less two. 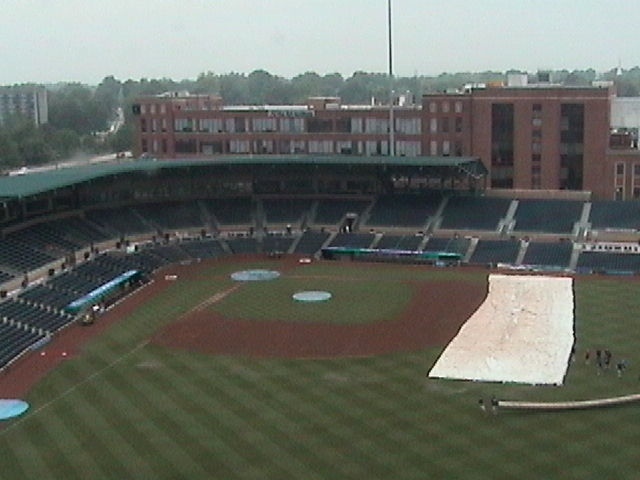 The Durham Bulls got rained out Saturday night, so they are going to try for a double header today, then head back here for a game Monday afternoon at 5. They are scheduled to be 7-inning games, but somehow this does not look good. The forecast looks a bit cluttered, so games could go long. Stamina is going to count for a lot. Game 47, 28 May, First Third Field, Toledo, Ohio. 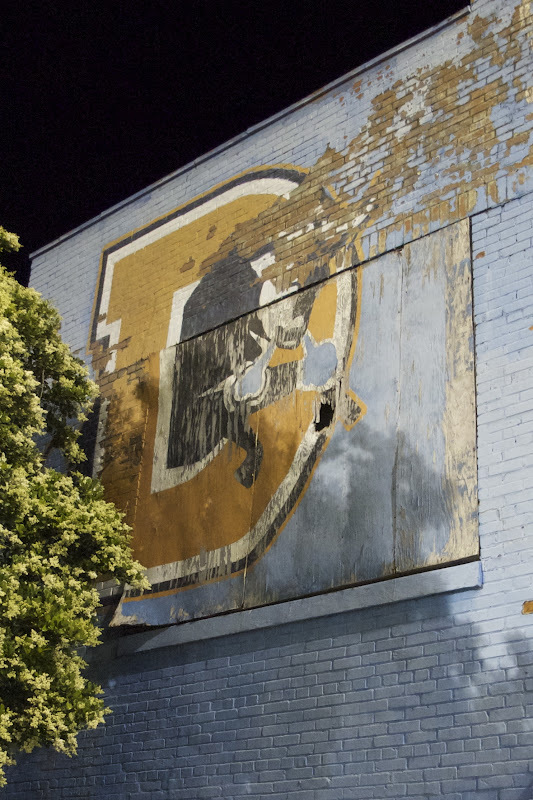 The Mud Hens are getting turned inside out by their parent club, the Detroit Tigers. See the Toledo Blade link for details. No reason for the Bulls not to take advantage of that, and they did. On the mound was the 32 year-old elder statesman of the Bulls pitching staff, Chris Bootcheck. Have to admire him stepping into the breach until the Rays can find a couple of starters for the Bulls. And he did a decent job, going 4 2/3 innings. This was his second start as a Bull and the first time he’s started games in quite a few years. The last time he saw regular duty as a starter was in 2005 with the Angels AAA team in Salt Lake City. Good job. I’m not quite sure what to make of Chris Carter’s day. His hitting helped a lot (two RBIs). But his aggressive base running led to him being thrown out twice trying for third base. And he grounded into two double plays. Craig Albernaz and Jeremy Hall (I guessed right!) have been taken off the Bulls’ roster and sent to Hudson Valley, making room for Rob Delaney, who passed through waivers, and new guy Jay Buente. 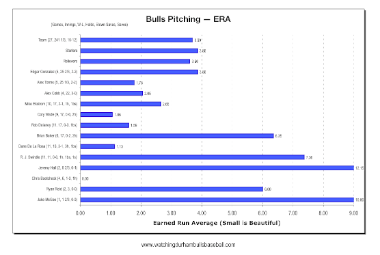 This is one of those relatively new numbers that really is a better way of evaluating pitchers than ERA. I like it. It does, however, punish the pitcher who gives up home runs as you can see by the rankings of Swindle (6), Bootcheck (3), and McGee (3) who have pretty high HR/Inning numbers. But, all things considered, that’s seems only fair. An interesting feature of this chart is how well Edgar Gonzalez, today’s starter, comes off. He’s been having back problems recently. We can hope that that sorts itself out. If you look around the web for information about Dan Johnson, most of what you find is about him as a Tampa Bay Ray. 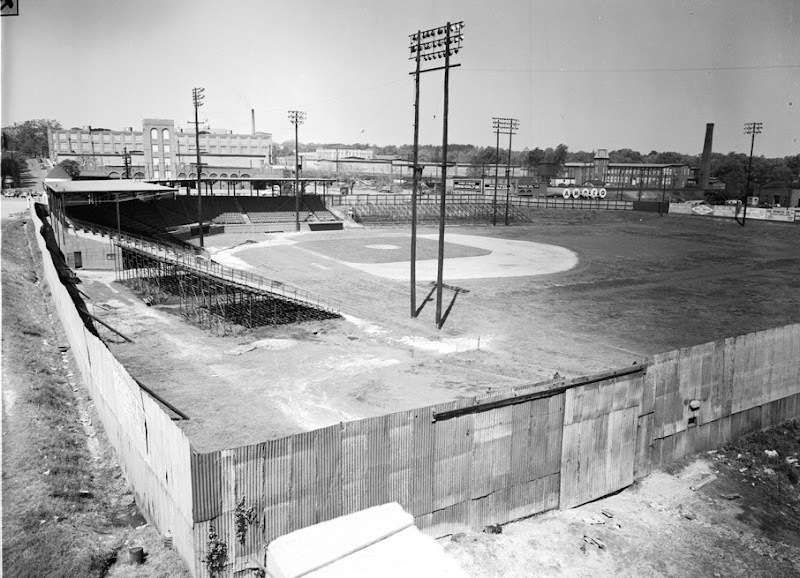 What I’d like to do here is provide some background on one of the best ballplayers ever to play for the Durham Bulls. Mr. Johnson played two nearly full seasons with the Bulls, 2008 and 2010. He spent 2009 playing in Japan. In both of his seasons with the Bulls he was called up to the Rays near the end and managed to get some timely hits for them. However, this year he is having a very rough time and was just passed through waivers. Fortunately for the Bulls, he accepted an assignment here. Whether there’s something wrong or he just cannot adjust to the Rays’ peculiar platooning approach I can’t tell. What I can tell, or point to, is that he was a superstar for the Bulls in 2008 and 2010. Maybe, just maybe, he can do it again. Dan played in 113 games, hit 25 home runs, had 83 RBIs, and a slash line (BA/OBP/SLG) of .307/.424/.556. Only Chris Richard had more home runs (26) or RBIs (88). He played 29 games at 1B, 10 games at 3B, and 8 games in left field. Thus, almost half of the time he was the DH. At first and third base he committed a total of 4 errors for a .992 rate at 1B and a .933 at 3B. (Note: for old-timers, 2008 was the year of Joel Guzman at 3B (90 games). Dan played in 98 games in 2010 and he put up some amazing stats before being called up. A slash line of .303/.430/.624 (that’s an OPS of 1.053 on 98 games!). He hit 30 home runs and had 95 RBIs before he was called up. 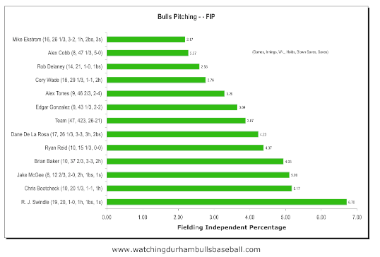 What may be as important for the 2011 Durham Bulls, however, are his fielding stats. In 2010 he played a lot of 3B (36 games), some left field (22 games) and less 1B (14 games). However, he only had one error at 3B (this year’s crew has had 6 so far) and none at 1B (the 2011 crew has had 6). My memory of DJ at third is of someone who, if he got to the ball, made the play. Plus, he just knows the position(s) very well. Dan Johnson was the International League’s Most Valuable Player for 2010 and the International League All-Star at third base. The Bulls won the South Division championship both years, but could not get through the Governors' Cup without him. Am I happy to have Dan Johnson back in Bulls uniform? You bet I am. I wish he’d done better with the Rays this year, because I think that he’s a much better ball player than this year’s stats show. In the meantime, welcome back! I've been out of town and I really don't want to write about the last five games (but I will, eventually). Much more fun to report something positive. According to The St. Pete Times Marc Topkin Dan Johnson has cleared waivers and is on his way back to the Bulls. Dan was our hero last season and a leading star in Triple A baseball. Here's hoping that whatever was getting in the way of success with the Rays gets out of his way with us. We really need him. No word on when he'll show up. Leslie Anderson got the day off on Wednesday. Guess he needed it. He came back on Thursday and hit two home runs and a double to pick up 6 RBIs and raise his batting average almost 30 points. Is Anderson about to realize the potential that brought him to the US and the Rays last year? We can hope. Meanwhile the top of the batting order, Desmond Jennings and Justin Ruggiano also had a good game. Jennings had two doubles, a home run, stole a base, and scored three runs. 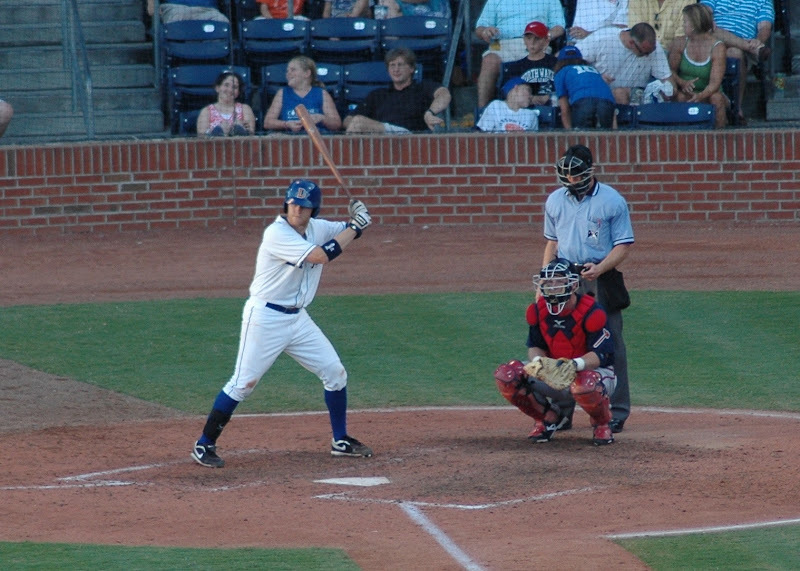 Ruggiano had two singles and two walks, stole 4 bases, and scored three runs. These three games have been triumphs for the hitters of both teams. Louisville has accumulated a total of 38 hits and 21 runs. 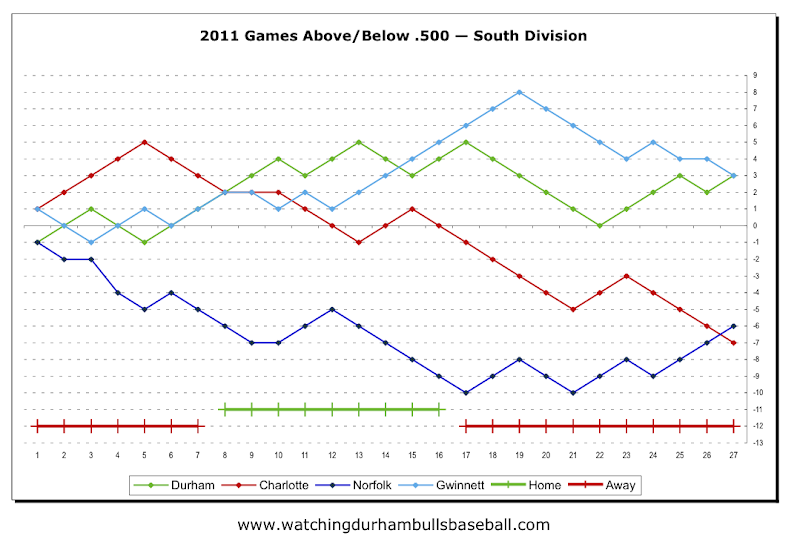 Durham has had 34 hits and 27 runs. Some of it can be put off to weak pitching, but give credit to experienced hitters as well. Speaking of pitching, Alex Torres began the night by striking out the side, but that was the last time he looked comfortable. The Durham Herald-Sun quotes Charlie Montoyo as saying, “”Whenever he starts throwing strikes, he’s a big leaguer for a long time because he has four great pitches. He’s a prospect, and whenever he gets it he’s going to be good.“ I would parse that as meaning, among other things, ”Let your fielders do their jobs. Quit giving batters a free ride.“ Torres had five walks to go with his seven Ks. Tonight wraps up the year’s contests with Louisville, unless we see them as we usually do in the playoffs. Very likely to be some very high quality baseball played tonight in the DBAP. I'll be taking a couple of days off to see what the mountains of NC look like this time of year. And to get away from the smoke that's been drifting in from that wildfire down East. Good luck Bulls! I got my first look at the Durham Bulls iPhone app today and it is terrific. An android app has also been released, but I haven’t seen it (and probably won’t). The Android app is supposedly essentially the same as the iPhone one. For iPhone users, you need to know that there are two apps in the iTunes store with the “Durham Bulls” logo on it. The one that you want, the one just released, is the “Durham Bulls Official App”. The other app is pretty crippled and not being supported at all. Also, it can be reached directly through the link above and through the Bulls website. Does it pass the “So What?” test? In a word, yes. I think it will turn out to be a very handy little program. This is the third or fourth minor league app that the developer, Critical Technologies Group, has put on the street, so my expectation is that they will have figured out how to efficiently retrieve data from the MiLB.com servers (which is about all that I’m interested in). I tried it out at tonight’s game and it worked just fine both over ATT 3G and the Bulls’ wi-fi. The Bulls press release goes into detail about all the things you can do with the app. About all that it doesn't have yet that I’d like to see is live audio streaming, and I’m told that’s on the way. Since I live on the far fringes of AM 620’s coverage area and can’t always get to a computer, that would be a very handy feature. Long time coming (I first heard about it late last season), but it works and it’s free. What more could you ask for? 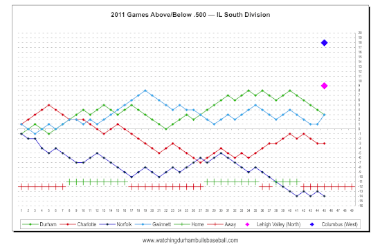 After sitting around for two days, the Durham Bulls are back in town to play the Louisville Bats for a couple of games. 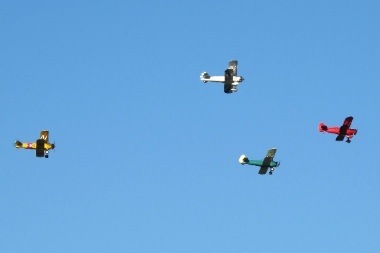 It does, however, appear as if they've brought their bad weather with them. We can hope that they don't have to spend yet another day in the dugout watching the rain fall. But if they do, at least they're home. Regarding rainouts, with all his free time these days, Dirk Hayhurst seems to be channeling his inner old man of the mountain. Most recently he offers advice on how to deal with rainouts. As a fan, I really like this series of posts. But I have to say that I think that if I were a teammate I’d find them a bit preachy. Maybe that’s just a really old man resenting a 30-year old posing as an old man. Speaking of rainouts, Nicole Johnson (wife of former Bull Elliot Johnson and Durham resident) blogs about a wonderful experience in Minneapolis recently. A while back I read an article about the design and development of Ferrari sports cars. Turns out that the incredible sound those cars make is a deliberate design element. They actually gather folks together and decide what the automobile is going to sound like. This is relevant to a baseball blog only in that it brings to mind what all of us dislike about metal bats, the pinging sound that they make. According to this piece, a lot of work has been going into making the performance of the bats more wood-like. Wonder why they can’t do something about the sound? Getting back to tonight's game, according to the Louisville Courier-Journal Bats Manager Rick Sweet isn't happy with his team's performance in the last couple of games. 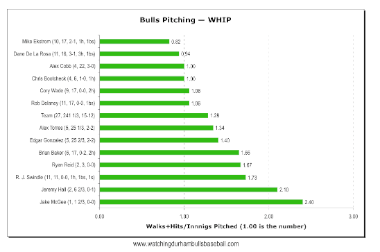 Walks and Hits per Inning Pitched is an interesting measure of a pitcher’s skill. In general, 1.00 is considered really good pitching. Basically what the stat measures is folks getting on base. 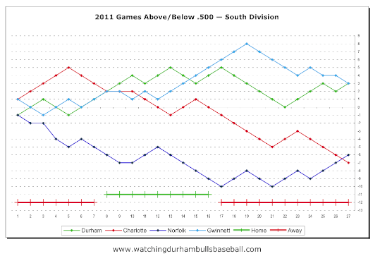 In the case of this year’s Durham Bulls, however, the season is really too young to make any big judgements. If they were still with the team, Rob Delaney (1.06) and Brandon Gomes (1.13) would fit in rather nicely. Dirk Hayhurst’s WHIP was 0.90 when he went on the DL. Should we be worried about three of our five starters being above the team average? You bet. The plan had been to comment on this game after today's game, since I really didn't want to talk about an 11-0 blowout. But today has been rained out, so I might as well put something up while we wait for tomorrow's proposed double-header. That box score is one ugly critter, ain’t it? Five home runs! Is it any comfort that only (only!) seven of the runs were earned? How did that happen? Not sure. Michael Aubrey, formerly of the Baltimore system, now of the Washington system, hit four of the home runs all by himself, accounting for 7 RBI and certainly a bid for at least a spot on the Nationals’ 40-man. 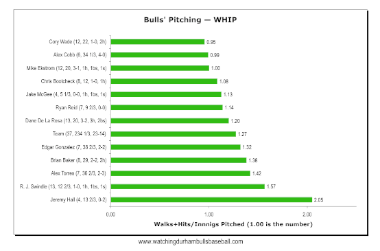 The only Bulls pitcher who didn’t give up a home run was R.J. Swindle, although he remains the season leader in that category having given up 6 so far. So rather than study that game any more I took a look at the Syracuse sports pages. Looks like folks up that way are going to be eating caviar in their near future. 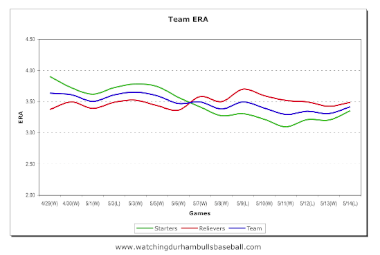 Today’s chart shows the Bulls’ pitchers’ cumulative ERA over the last 15 games. 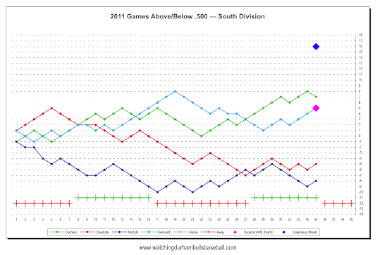 By cumulative ERA, I mean that it is recomputed after each game. 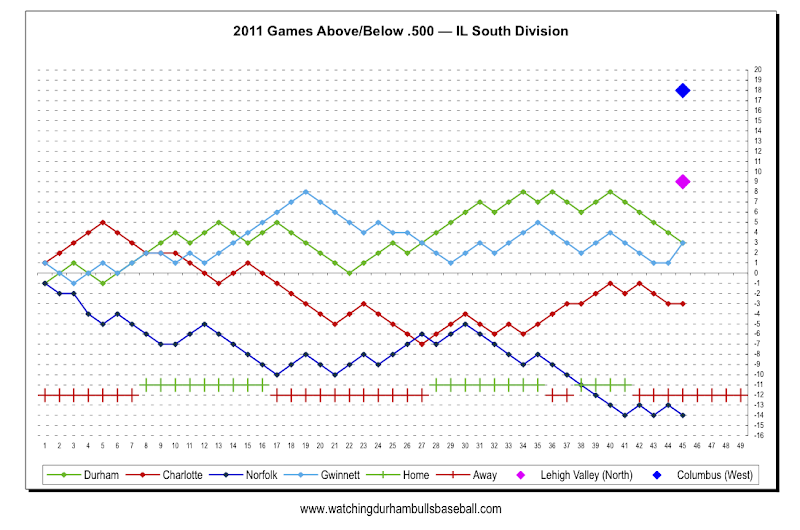 Thus each data point is the ERA for the total number of runs and innings to that point. For example, May 14 is based on 334 1/3 innings pitched and 127 earned runs. 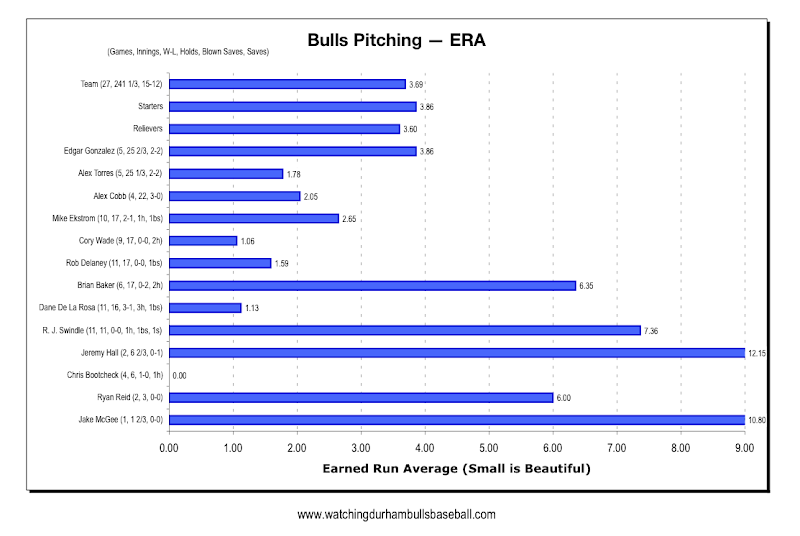 The Bulls ERA ranks third in the International League and compares well with previous Bulls seasons. 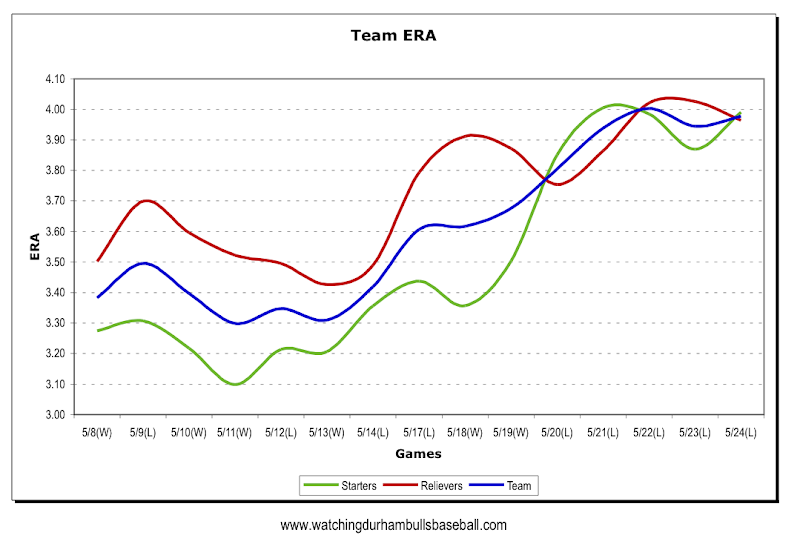 The interesting feature of this chart is how the starters and relievers contributions shake out. 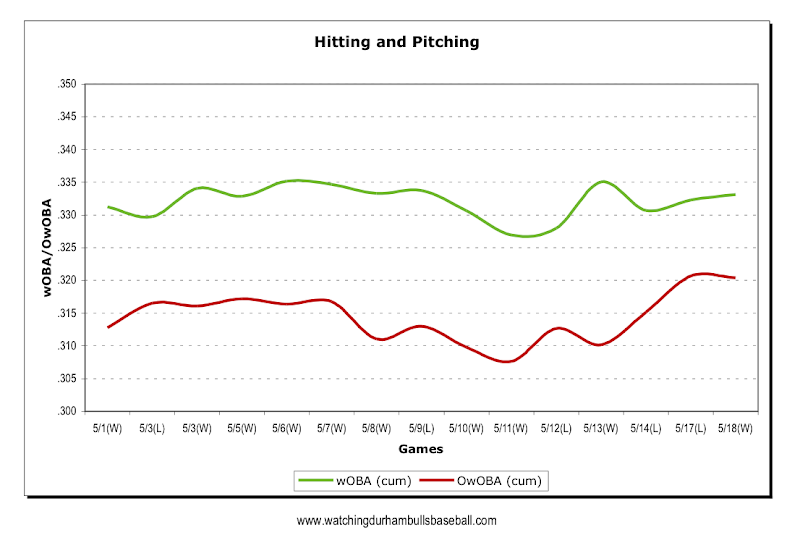 Overall, starters and relievers have about a 50-50 spread in innings pitched (177 to 157 1/3). 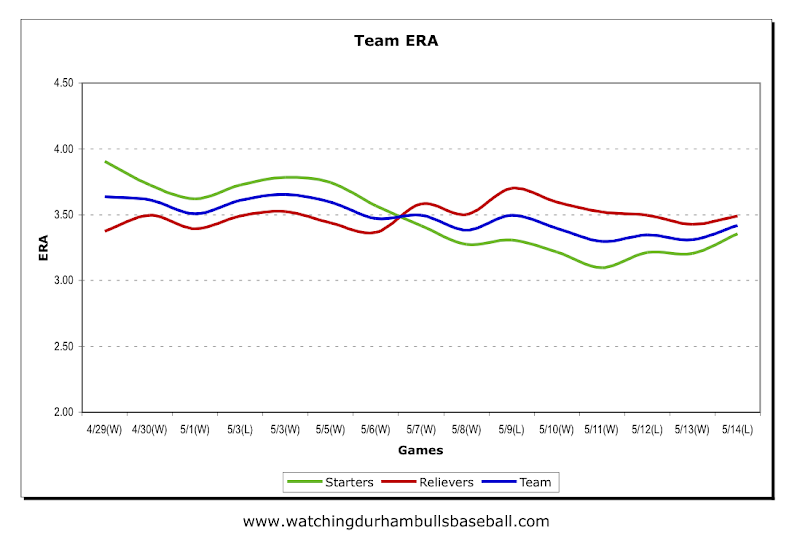 As you can see, over the last two weeks the starters as a group have been improving while the relievers have been having their troubles (remember, however, that the Bulls won 11 of those 15 games, so the idea of “trouble” is somewhat relative). If the weather prediction is on target, Scotty McCreery may end up singing in the rain today. Don’t know who Scotty McCreery is? You’re not from around here are you? 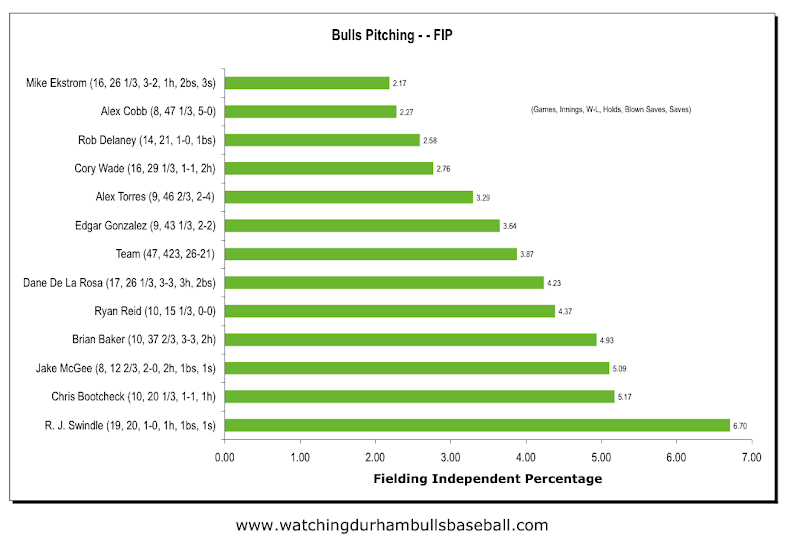 While we wait for the rain, how about them Bulls in the 7th inning last night? After two outs in the inning, nine more Bulls came to bat against three different pitchers. One got hit by a pitch (Lopez), two hit singles (Luna, Chirinos), three hit doubles (Olmedo, Canzler, Lobaton), and two hit home runs (Jennings, Anderson). Just two days ago we had a chart up where we worried about Leslie Anderson’s numbers. Last night’s two home runs (3 RBIs) pushed his numbers up quite a bit and they were his first home runs of the year. Omar Luna broke through the Mendoza line and reached .211. Unfortunately, two other hitters of concern, J.J. Furmaniak (0 for 5) and Robinson Chirinos (1 for 5) were not able to participate in the breakout. An oddity of the game was Anderson and Furmaniak in the outfield. Guessing that Guyer, Ruggiano and Carter up for days off. Given the power those three bring to the lineup, last night’s score is all the more remarkable. Brian Baker seems to be settling in. Six solid innings last night. His first couple of games as a starter were tough. In those games he was only able to get through 3 or 4 innings and his ERA ballooned up to the mid-7’s. In his last two starts (admittedly against not very strong teams) he’s gone six innings each and has gotten his ERA down to 4.34. Pretty good. And then there’s Dane De La Rosa, who got his head handed to him in the middle innings at the old DAP earlier this week. A solid two innings. I like this one. 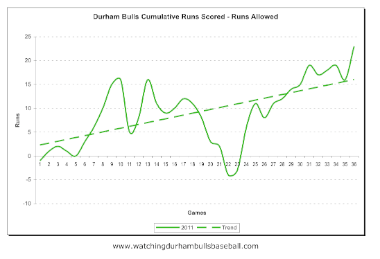 It shows the growing difference between the total runs scored by the Bulls and the runs allowed by the Bulls. If these numbers are plugged into the Pythagorean Expectation formula you can come up with the “expectation” that the Bulls won-loss record “should” be 20-16, below its actual 22-14. 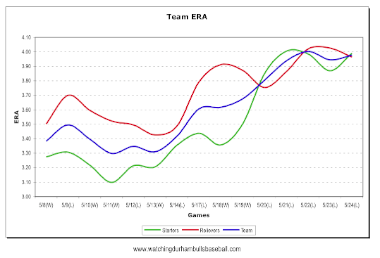 Traditional explanations for deviations from expectation are luck and/or bullpen performance. I haven’t noticed much luck in the games I’ve witnessed, so I’m going with the bullpen explanation. Yeah for the bullpen! As Walt Kelly’s Pogo used to say, “Friday the 13th comes on Friday this month.” So I was not too surprised when I checked in this morning and discovered Google’s Blogger was down (host to WDBB) and the last several posts to WDBB disappeared early Friday morning. They may not return. By now you will have chased down other reports on the game. At any rate, I missed the game last night because I allowed life to interfere with baseball (that happens some days). So I really don’t have anything to add. Brandon Guyer, who came out of the game in the 4th, appeared to be OK. The Bulls are reportedly just being cautious. Good for them. Richard De Los Santos might be out for the year. It was a great home stand. The Bulls are ahead in the South Division and off for a rematch with Syracuse. 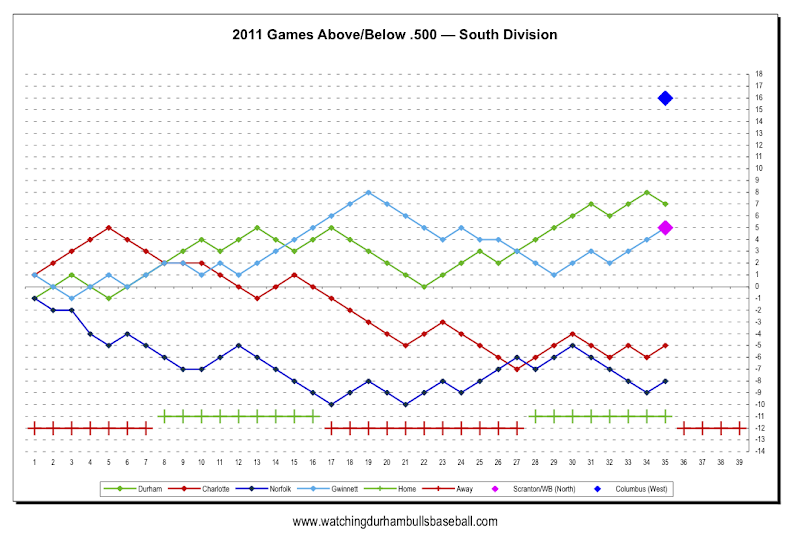 Here’s a plot of games above/below .500 for the teams in the South Division, plus markers for the leading teams in the North and West Divisions. 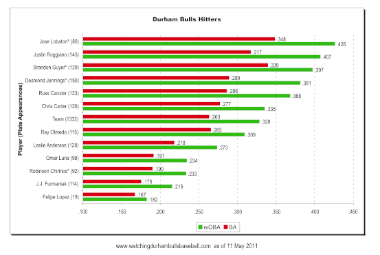 How are the Bulls hitters doing this year? One answer is, good enough to win most of their games. But to take a little closer look here's a chart with numbers for the current roster. 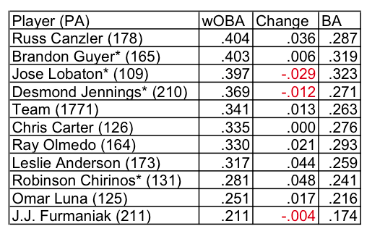 The players are sorted by their wOBA, Weighted On-Base Average, a sort of pumped up on-base average that provides a better picture of a player’s performance than just batting average. 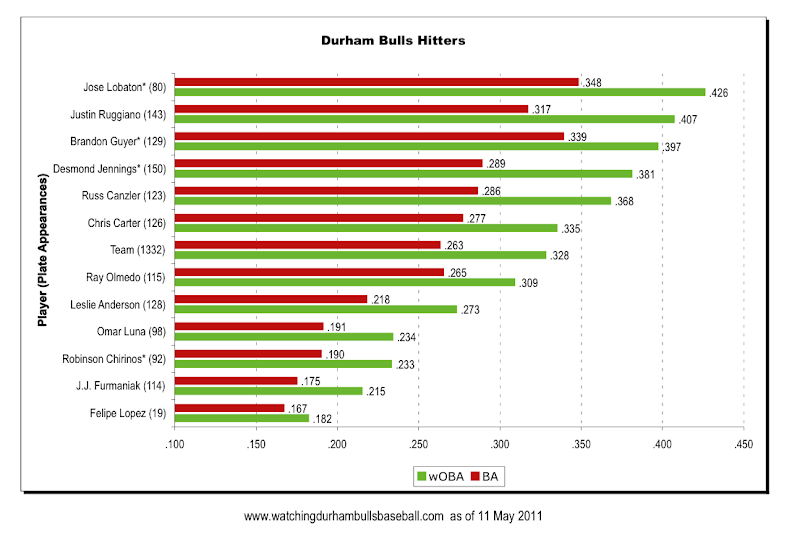 Also displayed is the traditional batting average number, which, mostly, tracks wOBA. The players marked with asterisks “*” are on Tampa Bay’s 40-man roster. The numbers in parentheses are the plate appearances for each batter. The sources for the data are Stat Corner and Baseball Reference. The infield isn’t doing very well at bat. Russ Canzler is the only infielder (other than Lobaton) hitting above the team average. Four players are below the Mendoza Line. The sample size is way too small to jump to any conclusions regarding Felipe Lopez, but he has not done too well since his arrival. Should we start worrying about J.J. Furmaniak and Robinson Chirinos? In a word, yes, even though they are very different players. J.J. is a veteran who can be expected to climb back up into the middle to high .200’s BA. Chirinos is a bit different because expectations were set so high coming out of spring training and because he’s on the 40-man. Nevertheless, Chirinos is more likely to be judged on his defensive skills than his hitting. I worry more about Leslie Anderson than any of the others. His play at first base seems to be improving, but he simply is not getting on base enough. 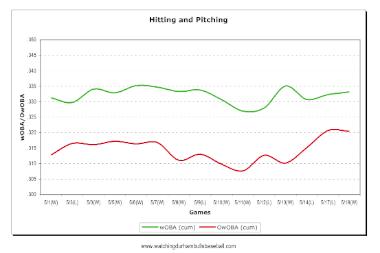 That said, his hitting has been very timely. His 14 RBIs count for something. The News & Observer (the News & Observer? I know. I am as shocked as you all) did an interesting piece on Justin Ruggiano. Triangle Offense has a good interview with visiting reliever J.P. Howell. First inning, second batter, Justin Ruggiano hits a home run, his 6th and ran up his team-leading total of RBIs to 28. There is no doubt that Ruggiano has been locked in these last couple of weeks and is setting a very high standard for the rest of the team’s hitters. By the way, that was the only, and obviously game-winning, run of the game. Pitching ruled the rest of the game. The Bulls got a runner to second base in the 5th, but that was as close as they came. An Indians runner got to third base in the 6th (single, sacrifice, stolen base), but not close to getting across. But the pitchers were the only guys who didn’t have play 11 innings yesterday and then get up for an eleven o’clock game today. Our guys collected the Bulls’ fourth shutout and the second of this home stand. Alex Cobb picked up his third win and looked very comfortable through six. J.P. Howell gave up a hit in his inning, but really had no trouble at all. For the first time since his arrival, Jake McGee looked like the pitcher we saw here last year. Two innings, 4 K’s (2 looking), a troublesome 4-pitch walk, and that was it. His velocity (when I noticed) was usually marked at 94, with a couple of 93s and at least one 95 in the mix. As is all too often the case, Brandon Guyer’s “cup of coffee” has cost him back here with the Bulls. He’s 2 for 11 since his return. Still, can’t complain. What a thrill that home run must have been up in Baltimore. Did anyone see the game on MLB? If so, how did it look? Bottom of the 11th inning, bases loaded, 2 outs, Justin Ruggiano at bat. I start packing up and turn to my seatmate, “Ready to go?” I ask. She nods. Off to the north the sky is filled with lightning flashes. Music from “The Natural” plays in my head. Ruggiano hits his obligatory walk-off shot to center field. Bulls win. We head for home, getting to the car just before a real frog-swallower of a rainstorm. But there was more to the game than that. In fact, the game never should have gone to the 11th. Before and after the game was tied in the 6th on a very odd play, the Bulls had runners on second and third base several times and could not get them across. Even Ruggiano missed a bases-loaded opportunity in the 4th. About that odd play. An oddity of the rules is that if a foul ball is caught, runners on base can go after tagging up. In this case Indian outfielder Corey Wimberly was on third base and shortstop Pedro Ciriaco hit a foul ball deep behind third base, almost to the tarp. The Bulls Felipe Lopez chased it down and caught it going away. Wimberly tagged up and made it home ahead of Lopez’s throw. Should Lopez have just dropped the ball? Hard to tell. I do remember Chris Richard (Bulls first baseman for a number of years) doing that once when he was way out of position chasing a foul ball and there was a runner on third. He just let the ball drop. By the way, Ciriaco gets sac fly credit for a foul ball. 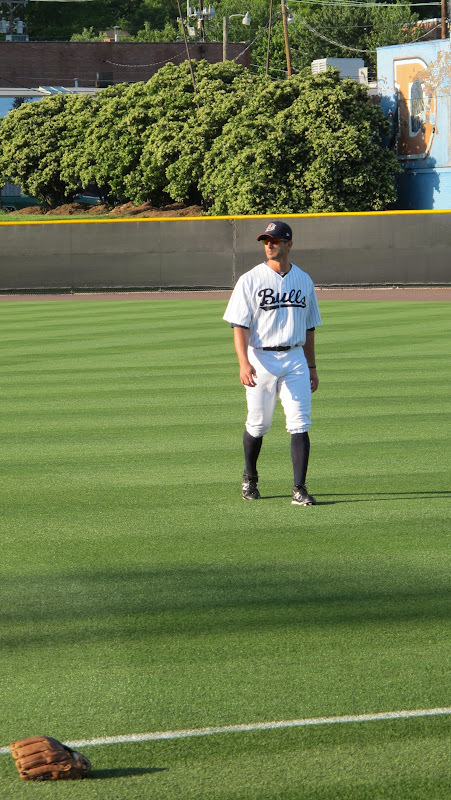 The busiest Bull last night was shortstop Ray Olmedo. I have him down for 13 outs (out of 33), 5 line drives caught, seven grounders to first, and a 4-6 play at second. Great night, not to mention reaching base five times in his six plate appearances (two singles, reached on an error, and an intentional walk (!)). More and more to like about Edgar Gonzalez. Seven solid innings last night. Last bit of quirkiness. In the 6th inning Charlie Montoyo went out to the mound, apparently to discuss defensive tactics in a two-out, runners on first and second situation. So the gathering at the mound was Montoyo, Gonzalez, Chirinos, Lopez, Olmedo, Luna, and Anderson. Here’s what’s quirky about that: everyone at the meeting was a native speaker of Spanish. Welcome to 21st Century American baseball. Photo pull below is from 8:32 this morning. Tarp is off after last night's post-game deluge. Game time (national TV) is 11:05. Hope the Bulls are feeling more rested than I do. The Bulls will be on MLBTV Wednesday (May 11) morning at 11:00 am. This is one of those "education day" games with the stands full of screaming kids. In its noisy way, kinda fun. Alex Cobb should be the starting pitcher. Neal Solondz and Chris Richard will probably be doing the play-by-play and commentary. HD cameras are in the park, and local broadcasts look great. So my guess is that the MLB broadcast will look pretty good, just lacking in some of the graphics and some of the camera angles you don't see in major league games. 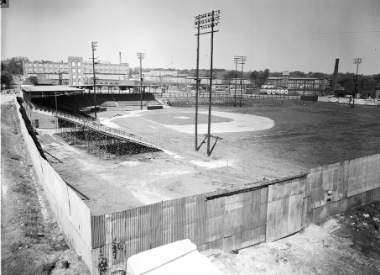 The good and the bad of the old Durham Athletic Park hasn't changed from last year: seating, field lighting, winning the game — not good; field conditions, nostalgic touches (Clay Aiken singing, Charlie Montoyo and Bill Evers playing catch) — great. The game this time started out slow and seemed to get slooooower, coming in at just over 3 hours, but it seemed much longer. Jeremy Hall had his best start in his short time with the Bulls and Ryan Reid did the same. That meant that at the end the 6th the Bulls were up 4-2 and things looked OK.
Dane De La Rosa came in for his first time since April 29th (we won't count his one pitch appearance against these same Indians on May 3rd). Rusty is perhaps not exactly the right word. Six hits and five runs later, the Bulls were pretty much out of the game. It was left only for R.J. Swindle to have his best inning of the year in the 9th. (Trivia: R.J.'s first appearance as a Bull was last year's DAP game). One other positive feature to this game is that the Indians used six relievers (did not have a regular starter for reasons I did not learn), which might be an advantage to the Bulls as the home stand continues. Remember Aneury Rodriguez? He was a pitcher I loved watching in the 2010 season. He's now a starter for the Houston Astros and got roughed up a bit last night in his second major league start. Oddly enough, there's a chance that he could end up being a Bull again this year because he was picked up on the Rule 5 draft and if the Astros don't keep him on their 25-man roster he has to come back to the Rays. But wouldn't it be neat if he made it as a major league starter? We can hope for him. Couple more photos from last night. Let's go back to the DBAP! Justin Ruggiano had yet another amazing game Saturday night. In fact he sort of had to win it twice. In the 10th with the score tied 2-2, Ray Olmedo tried to score on Ruggiano's single to center field, but he was thrown out. So when Rugg came to bat in the 11th with the bases loaded and the score tied 5-5 [Ooops! Thanks, Chris D] Chiefs 5, Bulls 4, it was naturally assumed that he would hit in the winning runs — and he did with a single to center. 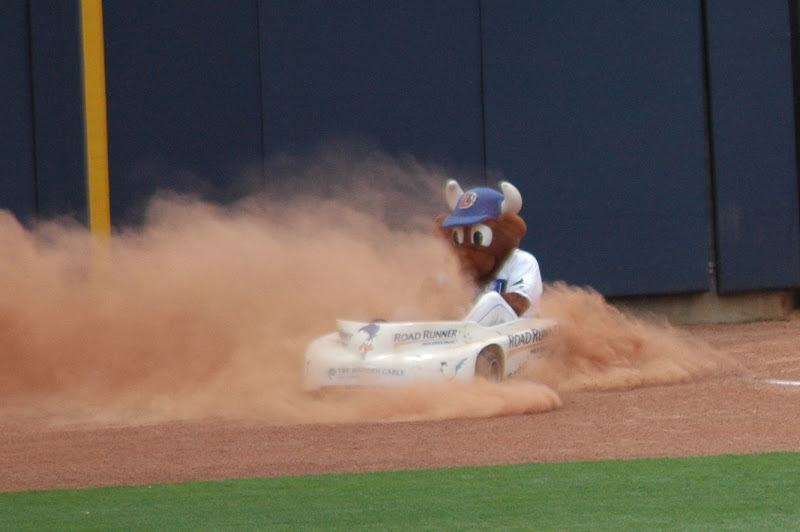 The win kept the Bulls two games in front of the Gwinnett Braves and its spectacular nature obscured a couple of oddities and issues that are worth mentioning. What we witnessed for 6 innings was a superb scoreless pitchers' duel between the Bulls Alex Torres and the Chiefs Yuneska Maya. All of these games with the Chiefs have shown them to have a fine crowd of starting pitchers. But (who else) Justin Ruggiano broke the tie with a RBI double and Russ Canzler hit him in. That certainly looked good enough. But then in a puzzling move, after J.P. Howell did his rehab inning, Chris Bootcheck came in, walked the Chief's #9 batter, and was pulled for Jake McGee. McGee got a ground out fielder's choice then gave up a home run that tied the game. My question is, why was Bootcheck pulled? He's just off the DL and did give up a walk, but something could have been wrong. And why McGee back-to-back? He pitched part of an inning on Friday and was back for this session. Then there was the 11th. New guy Ryan Reid got a ground out and gave up a walk. 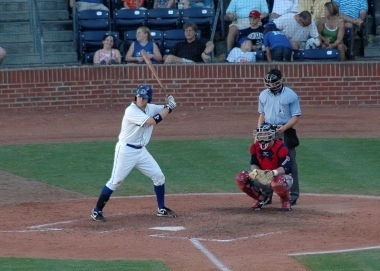 R.J. Swindle came in to give up three runs with a homer, single, double and hit batter. Not good. In fact, this is not a good year for R.J. This was his first time on the mound since April 30th (2/3 inning). He's being hit hard. In 11 innings he has given up 5 home runs, 11 earned runs, 16 hits. His signature slow curve has disappeared. As a final peculiarity, after giving up 3 runs in the top of the 11th last night, when the Bulls came back with 4 in the bottom of the inning, Swindle got the win! Overall, I'm beginning to think that R.J. may not be long for the Bulls. That's too bad, because he was a key figure in last year's championship team. We saw Felipe Lopez for the first time. He did a fine job at third base, where he was quite busy early in the game. On the other hand, he left Ruggiano hanging out in scoring position three different times. 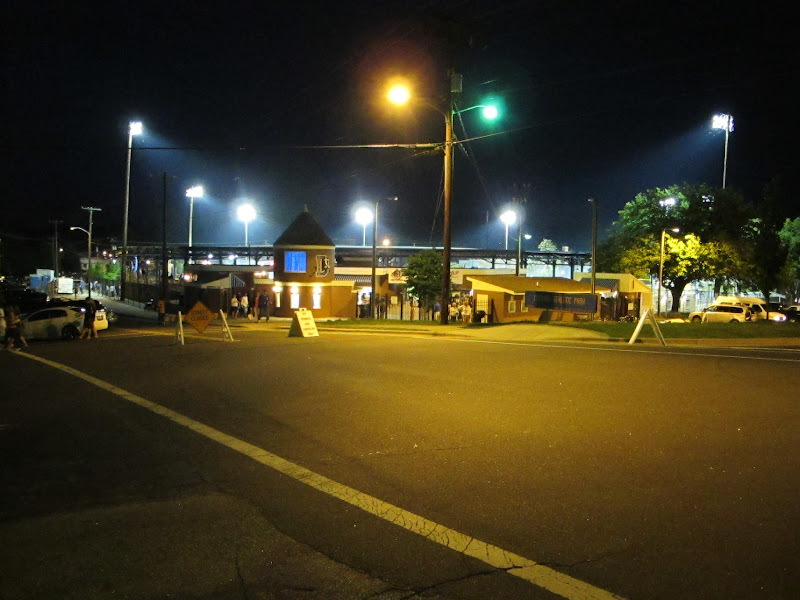 Meanwhile, for Rays' futurists, the Montgomery Biscuits have been over in Zebulon and won one last night as well. Our guys up with the Rays: Brandon Guyer did not get into the Rays' 8-2 win over Baltimore, but Brandon Gomes pitched a scoreless 9th (1 BB, 2 K's). Ballgames in May at the DBAP can be miserable. Last night it was cold. I kept adding layers and fortunately the wind wasn’t blowing. Still, the stands were getting empty by the bottom of the 8th. Up until then, the evening’s story was Syracuse’s pitcher Tom Milone, who was giving a clinic on careful, precision pitching. His 11 K’s were the most of any single pitcher against the Bulls this year. Meanwhile the Bulls’ Edgar Gonzalez, who is emerging as the key man of the Bulls rotation, kept things in check for a solid six innings. J.P. Howell got in one inning. He is reportedly on a 1-inning, 25-pitch, whichever comes first, limitation. After giving up a walk, he did just fine, especially his pickoff of a Chief runner on 2nd base. Last seen in Durham in 2007, Howell is working his way back after missing 2010 recuperating from surgery. Milone finally left the game after 7 brilliant innings and Chiefs reliever Adam Carr gave up a double to Desmond Jennings and zinged a couple of inside pitches before Justin Ruggiano really crushed one to deep center field. Ruggiano is up to 22 RBIs now. That homer, with Jennings on base, tied the game. If you were among the few left, you got to see a really thrilling walk off bottom of the 9th. Walk, pinch runner, sac bunt, broken bat popup up over the pitcher but at shortstop’s feet put runners on first and third, and Jennings’ single won the game. Video on Bulls’ website pretty well sums it up. But there was more than just a game going on last night. Dane De La Rosa is on a four-game suspension for his part in the exchange of inside pitches up in Indianapolis the other day. The pitcher who initiated the exchange, Rudy Owens, only got three days. Owens is a starter, so he is essentially unpunished. De La Rosa is a reliever, so the Bulls will miss him for a couple more days. Felípe López, who probably exemplifies the term “veteran infielder”, should be in Durham today. Lopez started the year on the Bulls roster, but was called up to the Rays before the Bulls season started when Even Longoria went on the disabled list. To be honest, I’m surprised he made it through waivers, but here he is. He hasn't played minor league ball since 2004. That makes him look a bit like this year's Hank Blalock. I think he’s going to give Russ Canzler a run for his money when it comes to playing time at third, but there’s going to be so much shuffling the next couple of days it’s hard to tell. Stats here and here. Outfielder Brandon Guyer got called up to Tampa Bay last night and is off to Baltimore. Why? That should become clear later in the day with the Rays also in a bit of lineup turmoil. My guess is that the Rays think that B.J. Upton is about to be suspended after a spectacular balls and strikes rant/tossed from the game episode the other night. Why not Jennings? Because it could be just a sit on the bench visit. The Rays have other outfielders, but they want to keep their roster full. What does it all mean for the Bulls? Not too much. Chris Carter or Leslie Anderson in the outfield. Canzler on first, probably. Or Canzler DHing. Guyer’s been hot, though, we’re going to miss that. If Upton is suspended, the possibility still exists for the Rays to pull a pitcher from the Bulls, because their Jeff Neimann just went on the DL. 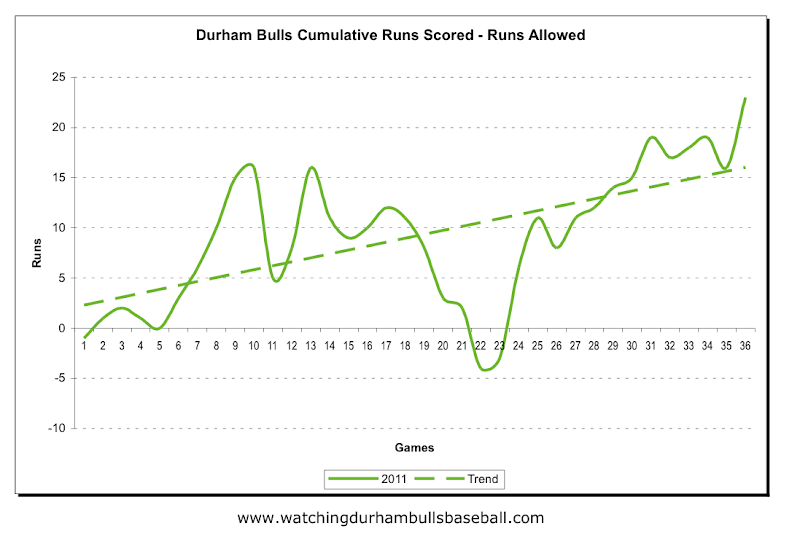 Keeping track of Durham Bulls pitching can be tough to do. 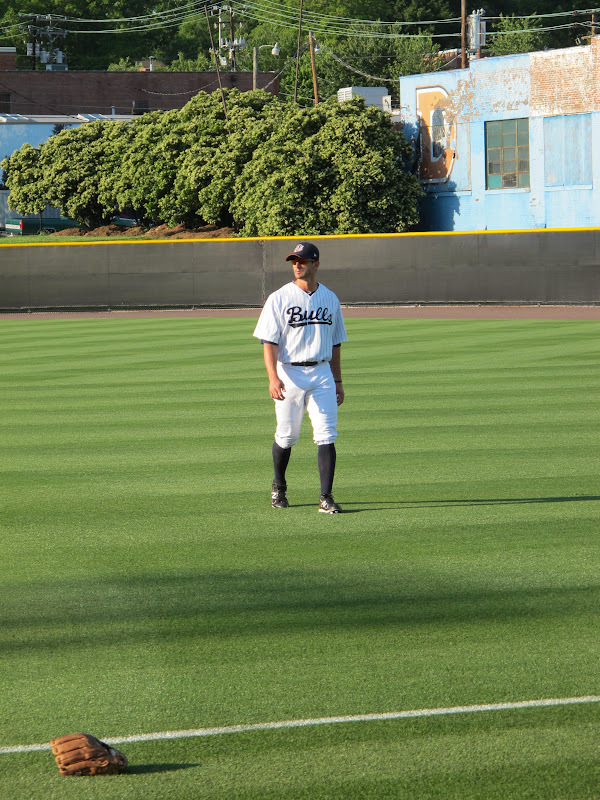 The season is not quite a month old yet and seventeen players have already taken the mound for the Bulls (eighteen if you count catcher Craig Albernaz’s two appearances). The Bulls' website seems to have trouble keeping track. For example, as this is being written Alex Cobb’s return from Tampa Bay does not show, nor does the departure of the unfortunate Paul Phillips to Montgomery. 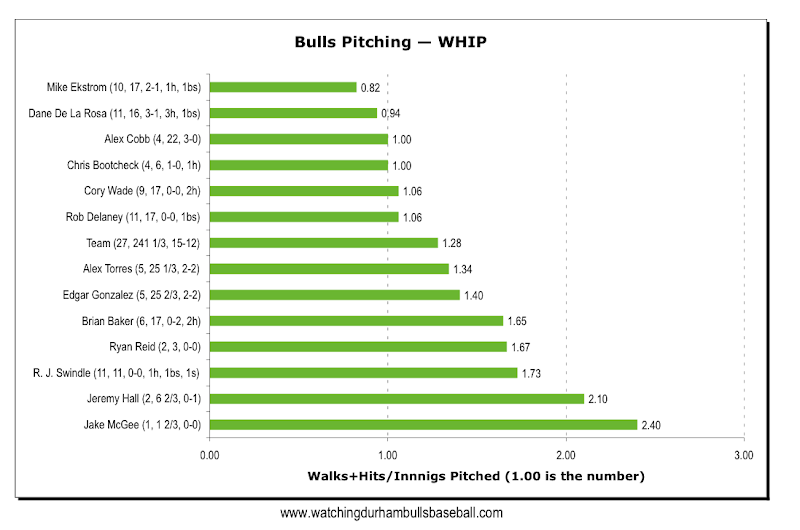 Even with those transactions, the Bulls are carrying 13 pitchers, one more than usual. Also, we can expect a visit from rehabbing Tampa Bay reliever J.P. Howell soon. The Bulls have two starting pitchers on the disabled list, Richard De Los Santos and Dirk Hayhurst. Chris Bootcheck just came off the DL. Ryan Reid and Jeremy Hall joined the Bulls while they were on this road trip. 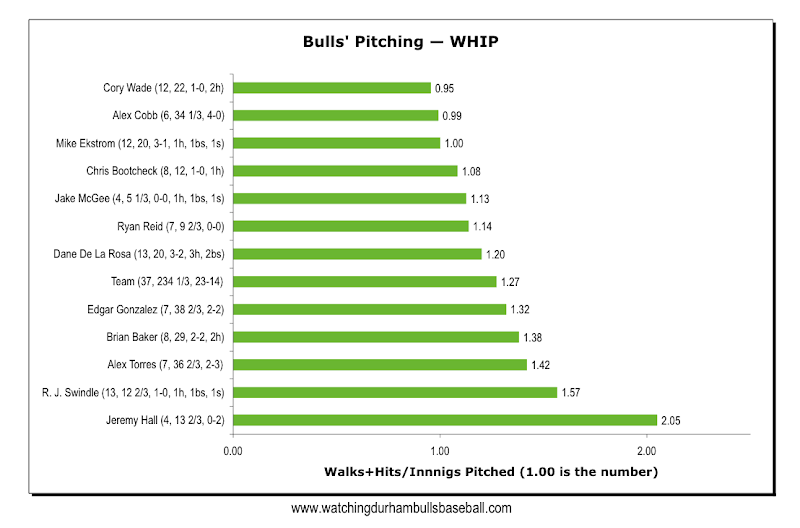 As a group, Bulls pitching ranks fifth in the IL on ERA and third on the WHIP (walks and hits per inning) metric. They are fifth in the league on won-loss percentage. As this chart (sorted by innings pitched) shows, ERA is mostly OK. You have to discount the low-inning guys who are down near the bottom. That’s going to get better. The two worrisome numbers are R.J. Swindle’s and Brian Baker’s, the same two who have WHIPs up and out of the zone. The stats guys don’t like ERA very much. To see their tRA and other such numbers, check here. This crew ranges in age from 23 (Cobb and Torres) to 32 (Bootcheck), so a pretty decent balance there. From a fan’s perspective it does not look like this year we are going to be seeing any fireballers — unless Jake McGee, just back from Tampa Bay, is supposed to be working on his fast ball. Just about all of this crew are finesse guys, which can be just as much fun to watch. Update 5 May, 2:45: Tampa Bay's Jeff Neimann may be going on DL. If so, then either a starter (Cobb or Torres) or a reliever (your guess is a good as mine) will be called up from Durham.